The human large intestine represents a mucosal surface which is constantly exposed to a wide variety of chemical and bacterial stimuli. 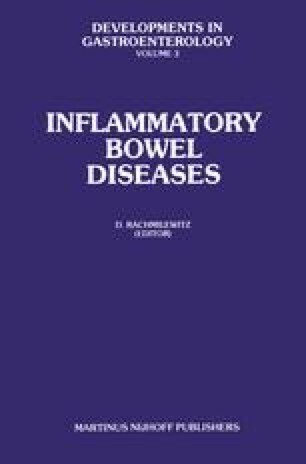 It is not surprising that inflammatory bowel diseases of the colon (IBD), both acute and chronic, are recognized as important medical problems with a significant morbidity and mortality. Included in this group of diseases are ulcerative colitis, Crohn’s disease, neonatal necrotizing enterocolitis and pseudomembranous enterocolitis. Until recently, these four diseases had two features in common. First, all were considered idiopathic since no etiology had been established. The second feature was the occurrence of the characteristic lesions in close proximity to an enormous bacterial population composed of 300–400 different species. This second feature has invited speculation regarding the role of intestinal bacteria in the inflammatory process. Despite extensive studies of each disease, only pseudomembranous enterocolitis has been associated with a specific bacterial etiology. This recent success has prompted a renewed interest in the association between the colonic microflora and IBD. In the past, this hypothesis has been pursued along several lines of investigation including: (I) identification of specific bacterial pathogens, (2) “dysbiosis” or alterations of the normal colonic microflora, (3) antimicrobial trials and (4) immunologic response to bacterial antigens.